Jessica Mendoza reacts to the news of softball and baseball being brought back for the 2020 Olympics in Tokyo, insisting they should never have been eliminated in the first place. Measured by almost any standard other than the family trees of fruit flies, Michelle Moultrie is, well, young. At 26 years old, she is a young human. In her current role as an assistant softball coach at Samford University in Birmingham, Alabama, she is young for her profession. Even athletically, hardly a forgiving criteria, she should only be arriving at her physical prime. 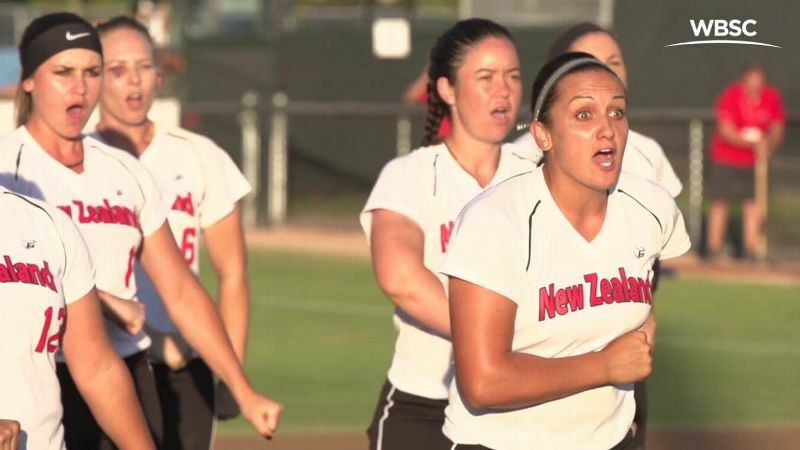 And yet as one of the most senior players on the United States national softball team, she is presented with evidence on a day-to-day basis that, like all of us, she is only getting older. You may not have heard, but Michelle Moultrie helped lead Team USA to a world title last month. "I don't use Snapchat," Moultrie said of the social media tool of the moment. "I only have, like, a Facebook and a Twitter. I don't even have an Instagram, so I'm a little behind." Alas. It happens to us all. 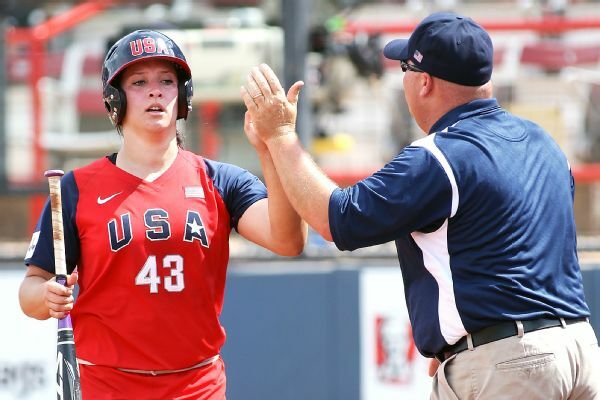 But for Moultrie and teammate Valerie Arioto, who debuted for the national team when some of their current teammates had yet to begin high school, Wednesday brought news that theirs will not be a generation completely lost in softball history. News that will be all the sweeter if they are around to represent that generation in four years. 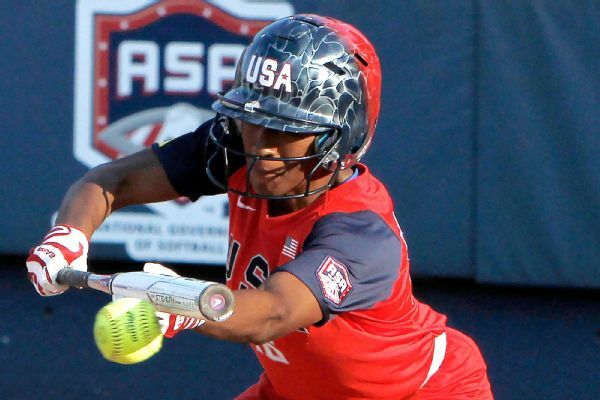 The grandest sporting event in the world isn't even in full quadrennial swing yet -- with just a handful of competitions underway in advance of Friday's Olympic opening ceremonies in Rio de Janeiro -- but the sport of softball has turned its attention to the next edition. Moultrie and Arioto's summer is finished, a World Championship won last month to end Japan's four-year-reign atop the sport. 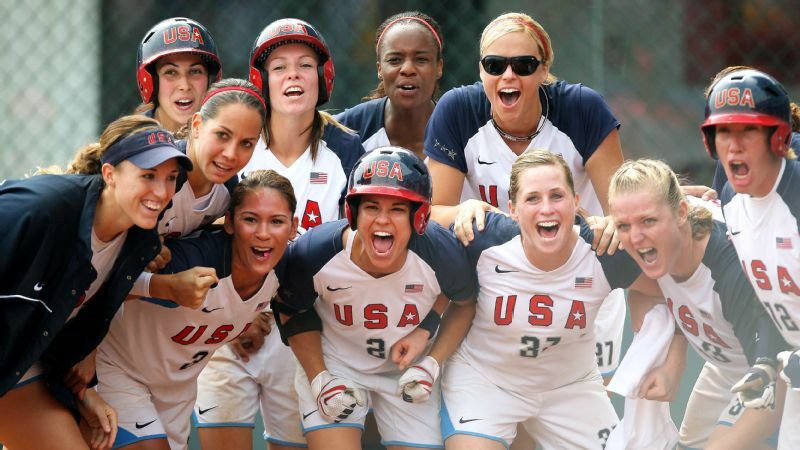 Softball won't be played in Rio, just as it wasn't in London four years ago. But it will be played in Tokyo in 2020. The International Olympic Committee voted to include it in the program as part of an initiative to allow host nations greater influence. That means the only two players who have been part of Team USA for each of the past six years, spanning world championship disappointment and success that occurred in almost equal anonymity, may yet be Olympic rookies in their 30s. "You can't build anything without a foundation," Team USA coach Ken Eriksen said. "Moultrie and Arioto, they're the rebar. They're the stuff you've got to have to build anything." It wasn't clear those two would be the foundation in 2011, but it was clear one was needed. A core of the team that settled for Olympic silver in 2008, stunned by Japan in what was at the time the final gold medal game for the sport, returned two years later in what was then the ISF World Championship (the International Softball Federation was since incorporated within the new World Baseball Softball Confederation). 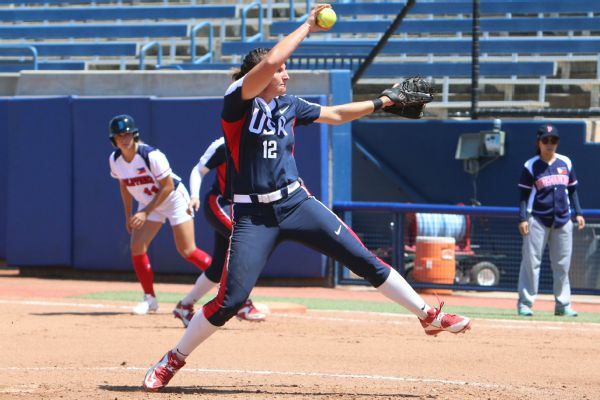 Still featuring Olympians like Monica Abbott, Caitlin Lowe, Jessica Mendoza, Cat Osterman and Natasha Watley, the U.S. beat Japan for that title in Venezuela. In a sign of things to come, the tournament wasn't televised in the United States. A nation went about its summer business and barely blinked an eye. With no Olympic future, many of the biggest names then understandably stepped away from international competition to concentrate on National Pro Fastpitch, the domestic professional league that has resiliently teetered between four and six teams since emerging in 2004 from the ashes of previous attempts. Valerie Arioto hopes to play in Tokyo, but also knows she's a big reason softball will be there. That was the backdrop when Arioto and Moultrie debuted in the league while still collegians at the University of California and University of Florida, respectively. The USA roster was full of active collegians at the time. It still has many more than it did in the Olympic era. That was partly by design, a desire to develop players for a possible Olympic return at some point in the future. It was partly by necessity; college players don't have rent to pay. 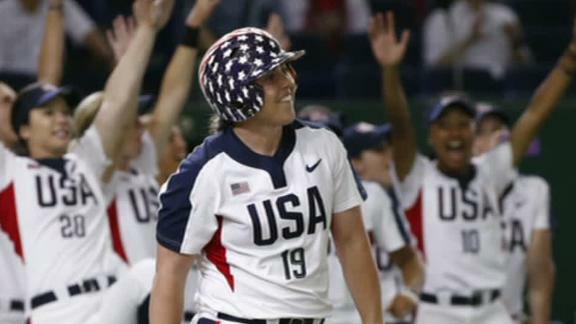 Playing softball for Team USA didn't make for an easy living even during the sport's initial run in the Olympics. Far from it. But the austerity forced by the loss of funding from the United States Olympic Committee was painful. A budget barely a tenth of Olympic-era highs went entirely to travel and competition. There was no money left for training beyond the limited run of those events, like the Pan-Am Games in which Arioto and Moultrie played in 2011 or the World Championship a year later in Canada's Yukon Territory. Key staff positions were cut. Even Eriksen worked without a paycheck. On limited pre-tournament tours, the team stayed in the sort of hotels in which you typically find youth teams, not national teams. Arioto is a year older than Moultrie, but a redshirt season for the former meant they each played their final college season in 2012. Which adds up to four years of trying to make this work. For Arioto, of late, that means spending much of her time in Japan, where she is in her second season with Honda's team in that country's professional league. She is in many respects one of the lucky ones, only a handful of Americans able to earn the best salaries available in the sport -- outside of Abbott, really the only truly full-time salaries. But it is still a nomadic life, all the more for a California homebody who purposely stayed close to home for college. And a grueling life, too -- the Japanese season is split into two halves with her Team USA duties filling the summer break. "There's that thought of should I have a 'real-person job' or this and that," Arioto said. "There was a time a couple of years ago when I decided this is a real-person job, and this is what I love doing. USA is family to me. So I kind of got over that." Continuing to play is even more of a patchwork endeavor for Moultrie. There are softball players who are born to coach, who know even while still playing that they will follow that route. Moultrie isn't one of them. She saw her future in business, but office jobs generally frown on employees taking multiple months off each summer to play softball. So one of the best hitters in the world, someone who went 7-for-7 with six RBIs in the preliminary round of the World Championship and ranked among team leaders in RBIs for the entire tournament, finds time when she can to use the same facilities as the players she coaches at Samford. Even then, to step away from coaching duties for extended periods each summer requires the cooperation of a head coach, in this case Mandy Burford. All of this to play in international events that are rarely on television or receive national attention. "You think about all the decisions you've made, whereas a lot of us could probably have really good-paying full-time jobs doing something else," Moultrie said. "Maybe if you're struggling paying bills, you might think about sometimes having to sacrifice with this situation. When you get to maybe December, you maybe think about it. But when you start to get around softball -- every time you get on the field, you just love it. Then you're just reminded that all the sacrifices and everything like that are totally worth it. It gives you a little bit of life experience, I think." Wednesday's vote doesn't wave a magic wand. It means change for Team USA players, but that won't come overnight. Based on past models, funding from the USOC will gradually increase as the program builds toward the 2018 WBSC World Championship in Japan and the 2020 Olympics. There are still challenges ahead to keep doing this for four more years, but there is also light at the end of the tunnel. Moultrie and Arioto don't get to tell their stories or show their skills in Rio. But these Olympics began with a victory for softball that means the team they helped maintain through lean years will get that opportunity, qualification willing, four years from now. Perhaps with them still as the foundation. "I hope I do, and I'm going to continue to try to," Arioto said of playing in 2020. "But if not, I think it's amazing to say I was part of a team that could help get softball back into the Olympics. "This team has been so loyal. There is a core of us who have been fighting, with a lot of the staff, to get it back. It has been a great experience."